As a Reiki practitioner, it’s kind of embarrassing for me to admit that I don’t like to meditate. We practitioners are ‘supposed’ to meditate. We’re probably ‘supposed’ to be good at it. I am genetically predisposed not to. So sitting quietly, trying to calm my monkey mind fills me with impatience and a strong sense of doom. I’m sure I’m not alone in this. But meditation does have some great benefits. It calms you down. It lowers your blood-pressure. It will help you to sleep better at night. And there are things you can do that will help you into that peaceful, meditative state without having to cramp up on a cushion and hyperventilate. Going for a long walk can be a lovely meditation, especially if you notice your surroundings while you do it. If that’s hard, if your mind tends to rev on the thoughts in your head, your to-do list, your grievances, whatever, so that you arrive at your destination with no clear recollection of how you got there, you might set yourself a task for the walk. Maybe count ten things that are yellow on your way. Maybe just breathe in time to your steps. This works well for sunny days, but what can you do when it rains? Doodling is good. And then colouring in your doodles when you’re done. 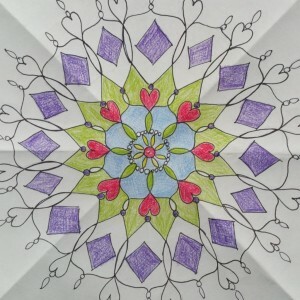 Mandalas are a good doodle to start with. Take a square of paper. Draw light lines corner to corner and in the middle horizontally and vertically. Then draw concentric circles (you’ll need a compass). Then start to play. Draw a circle at each point where the smallest circle meets a straight line. Add hearts, diamonds, leaf shapes. Join bits with squiggly lines. Eight times with each shape, repeating some and moving outwards. When you’ve got enough complexity, go over the drawing with a fine marker. Erase the pencil lines and then colour in the shapes. It doesn’t matter if it looks like crap. What matters is that you have taken some time to soothe yourself, to calm your mind, to let your thoughts go. If you don’t have a compass and ruler, my other favourite doodle is to make a bunch of dots on a piece of paper. Then draw straight(ish) lines to join the dots, without letting the lines cross each other. I end up with a bunch of triangles that I can then colour in if I want to. Again, calming, soothing, playful. Oooh! And you can do one long, continuous scribble line on a page. 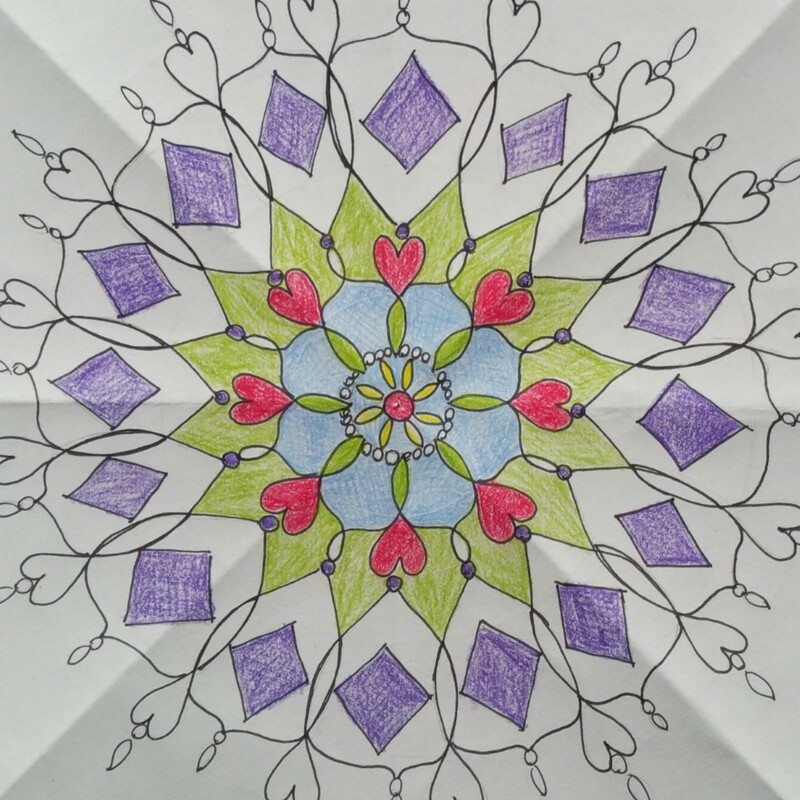 Loop around and overlap, closing the ends when you’ve got enough shapes to colour in. Choose your colours (coloured pencils are easy, though lately I’ve had a hankering to use watercolours…). And as you colour away, notice how it feels. Notice the paper and your pencil or paint brush gliding over it. Notice the way your breathing starts to slow. Notice where your thoughts go. Notice the way the metal box you keep your pencils in clanks on the table in rhythm to your colouring. Notice how much that annoys you. Move the box so that it no longer clanks. Notice how much better you feel. If thoughts of other annoyances come to you, resist the urge to get up and fix them. It’s those sorts of compulsions that led us to wanting to meditate in the first place. Finish colouring your piece. Allow yourself to feel annoyed. The perfect solution will likely occur to you. You can act on that when you’re done here. With clarity. And calm. I’m not saying I do this every day. But maybe once or twice a week, I give myself a half hour to doodle and colour. I tell myself I’ve earned the rest and that me calming down will be good for all of us. My father liked to play the piano. Often, when he was stressed, he would practice his finger exercises. There was no noticeable tune. You couldn’t dance to it, but it required concentration, slowing down and suspending the stresses of the day. How about you? What’s your favourite non-meditative meditation? Please let us know in the comments. …my hands will be painfully numb for hours the next morning. In the garden, everything fades away but the task. Added benefit – I’m surrounded by miraculous life. I mean c’mon…have you ever looked closely at the perfection of a flower’s design? ps. I love colouring too. Especially the squiggly line doodles. Used to make those all the time! You have turned me on to the joys of weeding. And I thank you for that. Thanks, Barb! It’s comforting to know others have the same kind of brain and that you can work around that. I used to go for long walks, and with my vision riding the scooter at least requires concentration and I’m in nature as much as a city allows. I’m reluctant to use my left hand but may try doodling with it. And Happy Anniversary! Give it a go, Beverley. It’s about the process and what it can do for us. What it looks like isn’t important. I used to make doodles years ago. I don’t know why but I didn’t do it lately. And walking for the sake of calming down.. not me. I start thinking of other problems.